After over two years of no deployments, I have a six month deployment to the Middle East coming up in 2017. Deployments are excellent opportunities to lower your expenses, increase your income, and stuff your tax advantaged retirement accounts (TSP and IRAs) full of Combat Zone Tax Exclusion (CZTE), tax free income. Before you deploy, or after you get back, make sure you pick up a no foreign transaction fee credit card that will reward you for your pre/post-deployment spending. American Express offers no annual fee cards to military servicemember, including the luxurious AMEX Platinum. The $550 annual fee is completely waived for active duty servicemembers and guard and reservists on orders over 30 days. I wrote previously about taking advantage of your deployments to boost your financial position, get a 10% return on your money, how to put $106,000 into your TSP in 1 year, and ways to save money on deployment. The typical TSP or 401k contribution limit is known as the “elective deferral limit.” For 2016, this limit is $18,000. However, there is an additional limit known as the “annual addition limit.” For 2016 this amount is $53,000. 2017 should have similar contribution limits with a possible slight increase. We should find out if there is an increase in October 2015. Any income earned in a CZTE is eligible for contribution to the annual addition limit ($53,000). One caveat is the Roth TSP contribution limit remains unchanged at $18,000/year. Any amount contributed to the TSP above $18,000 must go into the Traditional TSP. To maximize the tax efficiency of CZTE pay, my goal is to contribute the first $18,000 I earn while deployed into the Roth TSP and then any additional pays (base pay, hazardous duty, hardship duty location, hostile fire pay) into the Traditional TSP. With my six year time in service O-3 base salary of $5540, plus some extra pays, I should be able to contribute at least $5500 per month to the Roth TSP until it's maxed out. 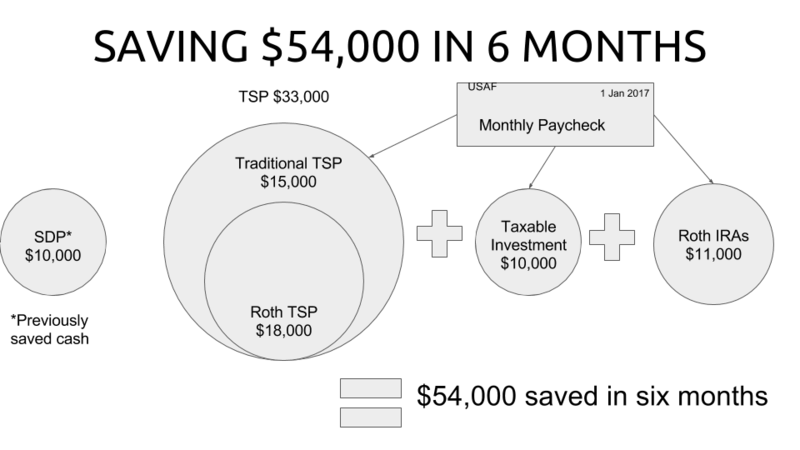 Once the Roth TSP is maxed, I will switch my contributions to the Traditional TSP. I should be able to contribute $18,000 to the Roth TSP within 4 months and then switch my contributions to the Traditional TSP for another $15,000 of contributions. Getting $33,000 of tax free income into my retirement accounts in one year will be a significant boost to my financial independence goal. The other major investment to focus on while deployed besides the TSP is the Savings Deposit Program. The SDP offers deployed servicemembers a guaranteed 10% return on their investments up to $10,000. It continues to pay while you are deployed and up to 90 days (3 months) after you return from deployment. On a 6 month deployment, you could earn $750 in interest. The SDP is a great place to park your emergency fund while you are deployed. In case you need to access the money, withdrawals are quick and easy through the MyPay website. My withdrawal request was processed and deposited within 3 days into my bank account. Since you can make contributions from your savings to the SDP (unlike the TSP, which you must contribute to from your paycheck), I recommend saving the $10,000 before you deploy so you have it ready to go. One catch is you can only contribute the basic pay you've earned in the combat zone and must wait 30 days in the CZTE area before contributing. However, when you have the cash set aside, you can max out your Roth TSP contributions while you wait the 30 days to contribute to the SDP. Also, don't forget that your Roth IRA contributions will go in untaxed, grow untaxed, and distribute the earnings and contributions untaxed after age 59.5. If you are receiving BAH, you cannot contribute that amount to the TSP. If you do not have a mortgage or rent payment due back home, contribute all of your BAH to your Roth IRA. BAH is always tax free as it is an untaxed allowance. Income naturally increases on deployment thanks to the various special pays you can receive. Depending on your location, you may be eligible for per diem, hostile fire/imminent danger pay, hardship duty location, hazardous duty, family separation allowance (FSA), and CZTE tax free pay. There isn't much you can do to control your increased income, but do check your LES a month or 2 after arriving in country to make sure finance started your special pays. When you get back to your home station, make sure the pays get turned off or they will come after you to collect overpayment. You will probably earn $3.50 per day in per diem, depending on the Combatant Command you are deployed to (looking at you, CENTCOM!). As a technique, you may just want to wait until the end of deployment to collect your per diem and other special pays like family separation allowance. Sometimes it's better to receive a lump sum at the end of the deployment and invest it or spend it on a well deserved vacation. Otherwise you may lose the effect of the increased income in each monthly paycheck. It's similar to the argument for collecting a large tax refund. It just depends on the type of person you are and whether you will put the small increase in monthly income to good use or will do better with a lump sum. Personally I like the lump sums as I don't like making investments in amounts smaller than $500 and in increments of less than $100. Our monthly expenses are already very low, allowing us to save 50% of my income without much effort. But when Uncle Sam will feed you, house you, give you a free gym, free transportation, free internet, a library, and makes you work 7 days a week, it's easy to just stop spending money for a few weeks or months. The biggest saving we'll reap is moving out of our rental. Our rent is $1450/month with electricity and gas on top of that. Our plan is to put our stuff into storage while I'm gone. We don't have much, but we do have some nice mid-century modern furniture that we got a great deal on that we'd like to keep around. Storage should cost about $100/month for the space we need. That allows us to save $1350/month extra into our financial independence investments. My wife is planning on moving closer to her family while I'm deployed and either utilizing family guest bedrooms or renting a small efficiency apartment near her work. She can still telecommute but it's nice to be close to her coworkers and family. Her savings rate will probably drop a bit from the aggressive 90% she maintains now, but I suspect she'll still be above 80%. Our plan for our mobile phones is to put our lines on hold while I'm deployed. I'll buy a local sim card with a few minutes and texts but mostly for the 4G LTE data. Always good to have a backup if the MoraleNet Wi-Fi goes down or runs slowly. An additional personal goal is to go 30 days without spending a dollar. In the desert this can be pretty easy as food, lodging, and entertainment is provided for. However, AAFES is still there and Amazon does deliver (although not in two days) so there are temptations to spend money while deployed. I think 30 days is a good initial goal to just let the savings pile up. One other tool I will be buying before I leave for deployment is a VPN, or virtual private network. Last time I was deployed I purchased PIA or Private Internet Access. For $6/month you can safely browse the web without nefarious Middle Eastern states snooping on your private data. It also serves well as the best VPN for torrenting I ever used. VPNs can usually allow you to access geographically limited content, like Netflix, HBO Go, Amazon Video, and YouTube. VPNs also allow you to get around internet filtering software, so you can browse unrestricted by the morality police of backwards Middle Eastern countries. Especially with open Wi-Fi networks overseas, it's important to use a VPN to protect your personal information, what sites your browsing, and to keep your banking information safe. Finally, when I return from the deployment I plan on taking my full reconstitution leave and travelling a bit with my wife. Right now we don't have any solid plans, but we may head to a ski destination in the southern hemisphere or go tour some National Parks. Not sure yet, but it will be much needed time off. What is the most you have ever saved on a deployment? How long have you gone without spending $1? Have you ever gone past the $18,000 TSP contribution limit? Let me know in the comments! 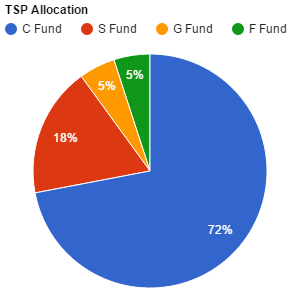 If I put money into a traditional TSP while deployed is there any kind of tax advantage? I am already putting tax free money into a tax deferred account which makes me think there would be no advantage. However, when I complete my taxes at the end of the year will I be able to deduct those contributions from my income to increase my tax return next year? The tax advantage is the CZTE Traditional TSP contribution is withdrawn untaxed from a TSP account in retirement. However the gains on that contribution are subject to income tax when you withdraw in retirement. That’s why putting CZTE tax free money in a Roth TSP, Roth IRA, and taxable brokerage account makes the most sense. The taxable brokerage account gains are only taxed at the short or long term capital gains rate. You will not be able to deduct CZTE Traditional TSP contributions, as you paid no federal income tax in the months you were deployed and made the contributions. Sounds good. I’ve been putting my excess earnings in my taxable account but I didn’t know if there was some tax advantage I wasn’t considering since you mention putting money into your traditional TSP while deployed. Great post! I was stopping by to comment on the same thing as the previous poster, Sam. I know finance offices fairly frequently ignore the “unallotted pay and allowances” rule, but don’t be too surprised if dropping $10k in at once doesn’t work. I am trying to surpass $18,000 in contributions to mypay, I only have two months left in the year. I want to be aggressive with contributinons and max out at the E9 pay $8165.10. I get an error on the mypay web site. After numerous hours, emails, and phone calls. I was told to fill out hardcopy of TSP form TSP-1-U-C which is typically used for “catch up” contributions and surpass $18,000, I guess there is no equivalent or similar form for military in combat zone that has $54,000 limit and this form must be filled out to surpass $18,000. Is this correct? Or can you surpass $18,000 through mypay web site alone despite repeated error messages. I was able to go over 18k in My pay. I am an Air Force O-3E at the over 10 years point on the pay chart…I still receive an incentive pay because of some of the skills I acquired as an enlisted Airman as well. At my last assignment I deployed 5 times in about 3.5 years…4 of which were to the desert. 3/4 of my trips out there were right around 100 days. Because I was aggressively funding my traditional TSP, 6K+ a month, I didn’t have much to work with. Somehow I ended up putting just over $19K in tax-exempt contributions into my traditional TSP and am set to max my roth contributions by the end of the year. Thanks for the awesome blog! I hope you find the time for more insightful posts while you are overseas.